This elegant 18ct gold ring is channel-set with seven dazzling diamonds. With a total diamond weight of a half carat, this chic eternity ring will make an ideal gift for the woman of your dreams. 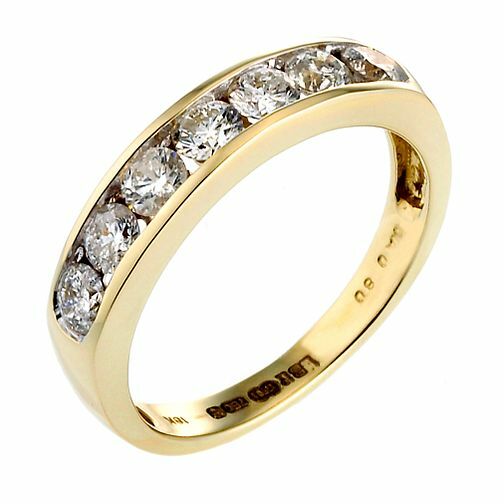 18ct Gold Half Carat Diamond Eternity Ring is rated 4.4 out of 5 by 7. Rated 5 out of 5 by Anonymous from The ring looks stunning. I received my order on time as stated, I had it delivered to store, the staff were excellent, can't wait until xmas when my wife opens the gift. It was also 50% off GREAT DEAL. Rated 5 out of 5 by Anonymous from Excellent ring Bought as an Anniversary gift, my wife is very happy with the ring.